Danbury Centre Strings Participates in 'Orchestras Feeding America' Sunday: Danbury Centre Strings concludes their season this Sunday, April 28th at 3:00 PM at Broadview Middle School Led by Music Director, Glen Lebetkin, at the Danbury Music Centre, Danbury Centre Strings (DCS) provides a challenging, exciting, educational ensemble experience for string players. David Krafik has been principal of Park Avenue School for the past 10 years and during that time he has shaped the school and the students into valuable parts of the community. Jerfrey Martinez, a senior at Danbury High School has also been an integral part of the school community as an exceptional member of the Danbury Early College Opportunity program at DHS. 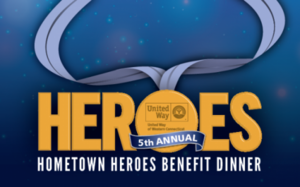 Heroes are individuals in the community who distinguish themselves through philanthropy and volunteerism. Krafik is a Danbury native who attended Hayestown Avenue School and Broadview Middle School before graduating from DHS and attending Western Connecticut State University. He started his career in education as a substitute teacher holding several positions before becoming principal at Park Avenue. At Park Avenue, Krafik has made great strides not only academically by teaming with United Way for the kindergarten readiness program, but in making the school an integral part of the community. In June 2017, Krafik and his staff completed a community garden with vegetable beds and walkways – the project encouraged participation from families, and has been a way of connecting the school with others in the community. Martinez has been an integral part of his school’s DECO program, interning for an area business and maintaining a 3.5 GPA while earning more than 15 college credits while still in high school.